November moves along and it is time for tall black hats, turkey, and indigenous peoples in highly incorrect head dresses. In the United States we all know the drill: the Pilgrim Fathers of Plymouth invited their Wampanoag neighbors to dinner in September 1621 to give thanks for a successful harvest. From this event there evolved the American tradition of Thanksgiving now celebrated on the fourth Thursday of November annually. Like all myths, this one is comfortable, familiar and full of inaccuracy and complication. We love it—BUT there’s more. The standard view is of a group of folks in black hats or white bonnets sitting at a long table eating corn and turkey. The invited guests, Wampanoag warriors, are either at the table or sitting on blankets on the ground. Occasionally the picture gets some historical buffing up: more accurate clothing, more accurate menu, activities involved, celebration over three days instead of one, inclusion of native culture and conflicts, and so on. It may even be that the Wampanoag did the inviting. 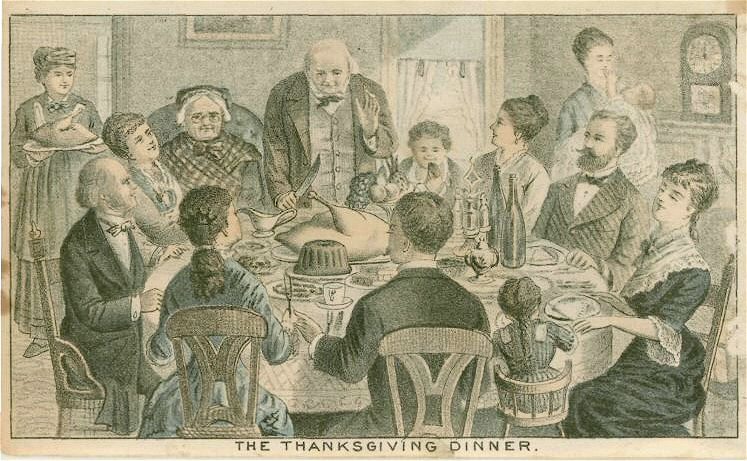 Less often someone challenges the “First Thanksgiving” myth entirely. The giving of thanks for bounty, successful harvests, freedom from epidemics, and, most often, military victories exist across cultures, religions and locations. Giving thanks, strong as it is in the Christian tradition that gave rise to the standard myth, rises from roots deeper in human nature. To begin with, most native peoples had ceremonies and celebrations of thanks for good harvests of their own. That includes the Wampanoag. Thanksgiving clearly went on in North America before Europeans caught on to the idea. That isn’t to say Europeans didn’t bring their own ideas about God and giving thanks. They certainly did. Harvest festivals were common in Europe and various settler groups brought them over. Evidence for Catholic Masses, somber ceremonies, and raucous dinners all exist. 1551 Coronado and his men held a thanksgiving celebration at Palo Duro Canyon in what is now the Texas panhandle. 1565 Mass of thanksgiving (and feasting with indigenous neighbors) took place at Saint Augustine Florida. 1610 Jamestown settlers held a prayer service in the spring when food arrived from England after a terrible winter. Canadians trace the celebration of Thanksgiving in their country to an Englishman, Martin Frobisher who, after a harrowing voyage, held a formal Anglican service to give thanks not for harvest but for survival in 1578, beating the pilgrims by 43 years. 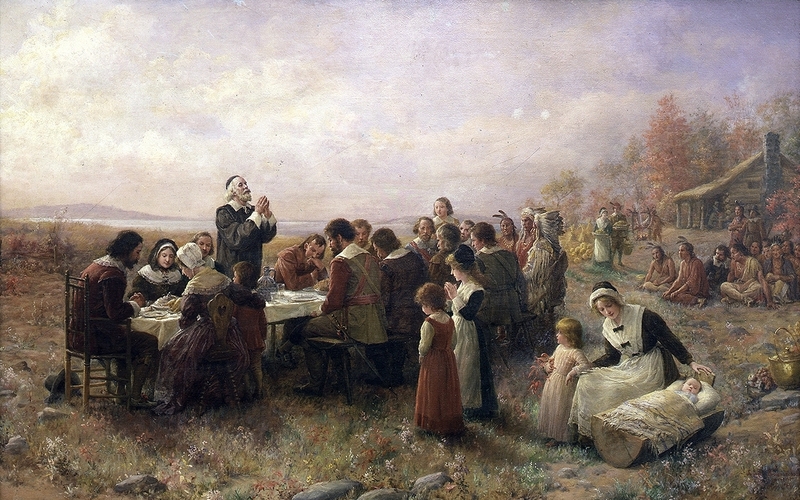 Likewise the French settlers who came to New France with Samuel de Champlain held feasts of thanks beginning in 1604. On a personal note, judging by my mother’s family, French Canadians celebrate with joy and gusto whatever the occasion, including Thanksgiving. I’m guessing there was Mass followed by tons of food, drink and a good party. Settlers have continued to come into North America, bringing new foods and more reasons to give thanks. Most of us no longer focus on the harvest as we did in more agrarian days, but still find plenty of reason to give thanks and are grateful for a day that reminds us to do so, whatever tradition we like to remember. Perhaps the most compelling Thanksgiving image is one of the family gathered around the table. So whether you celebrate on the fourth Thursday in November, the second Monday in October or any other day you choose; whether you eat turkey, tortillas or dim sum; whether you relate to those pilgrim guys or not: Happy Thanksgiving. Glorify God for His gifts. As far as I know, the fourth Thursday in November became a day of thanksgiving in the US by order of Abraham Lincoln, following the battle of Gettysburg in 1863. It was therefore originally the occasion for the Gettysburg Address and, at that time, had nothing to do with the Massachusetts Bay Colony. Or the harvest, either, come to that. Thanksgiving in time of war seems like an entirely different thing, but it is one of the most common origins for a thanksgiving celebration. 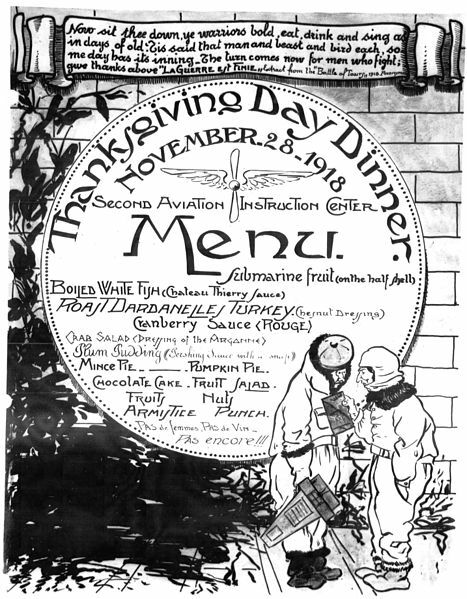 I loved the “Armistice Punch” on that 1918 menu. In our family, when we go around the table with what we’re thankful for, health is usually at the top of the list. We’re pretty far removed from the “harvest” of our food.